Altos Ushuaia Hotel & Restó in Ushuaia - Official Website. 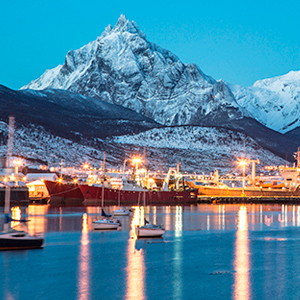 Discover Ushuaia. Come to know the most southern city on Earth. Located on the road to the Martial Glacier, Altos Ushuaia Hotel & Restó is a cozy and familiar place where you will feel at home. The entire establishment has been designed with special attention to the natural conditions of the land and the wonderful views and lighting that the hotel receives. In addition, Altos Ushuaia Hotel & Restó is continually renewed, adapting its facilities and services to offer its clients a modern and functional hotel, but without losing its warm atmosphere and its friendly service. The hotel also offers the Altos Restó restaurant and its excellent José Bartolomeo Recchia meeting room, among many other improvements. If you book through our official website, we guarantee you the best price. Transfer from the airport to the hotel, booking a minimum of 2 nights . (Exclusive offer for reservations through the hotel's official website). A free dinner (starter, main course and dessert) booking a minimum of 4 nights. (Exclusive offer for reservations through the hotel's official website). Getting to Ushuaia is easier than it seems!